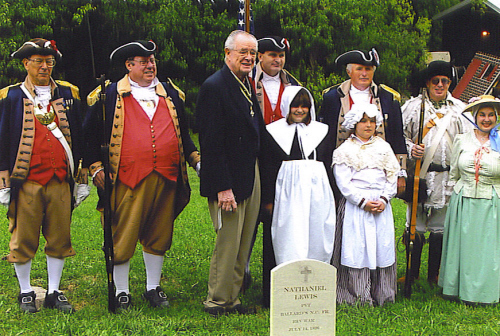 Harry S. Truman Chapter President Rommie Carr and the MOSSAR Color Guard are shown here at the Nathaniel Lewis SAR Dedication on September 17th, 2006. Also pictured here is Mrs. Cathy Owens, current Senior National Librarian and Senior President of the Corps of Discovery Society of the Children of the American Revolution in Kansas City, MO. Also pictured here is Victoria Stapleton and Anna DeVenney who are members of the Corps of Discovery Children of the American Revolution. (L-R) Major General Robert L. Grover, MOSSAR Color Guard Commander; Captain James L. Scott, Rommie Carr, HST Chapter President; Dirk A. Stapleton, Victoria Stapleton, Anna DeVinney, Alvin L. Paris, Captain Russell F. DeVenney, Jr., MOSSAR 1st Vice President; and Mrs. Cathy Owens.